After a quick trip to find a baby bottle, and our first discovery that hardly anyone in the shops surrounding our apartment spoke any English we stopped in at a nearby bar (which in Rome really means coffee shop) for lunch. Sadly, the food was microwaved and I suppose from a frozen dinner but we were so tired that it probably didn't matter that much that first day. Back to the apartment the kids and I took a nap, while Amy went out to try to make a phone call and fulfill an interview at Vatican Radio she had set up with Charley Collins. When Amy returned she told us that Charley had agreed to meet us in front of Vatican Radio to take us on a little "get aquainted" with our part of Rome tour. We met him just in time to find that two of his fellow employees were heading out to catch the express bus so that they could have dinner at the Hard Rock Cafe in Rome. As we walked back without Charley, we stopped and ate at one of the restaruants and had a great meal, followed by the kids getting gelato at another place Charley had recommended. Evening came, the First Day. 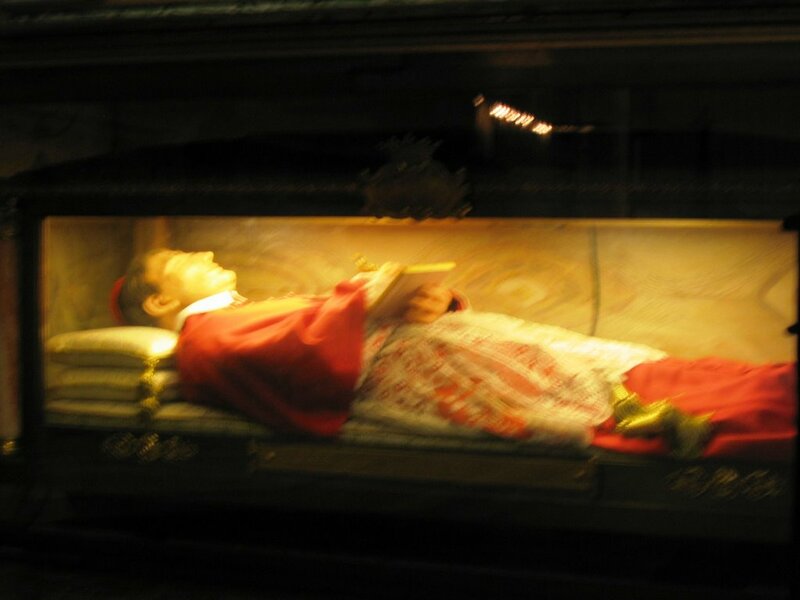 Would it be Blessed Giuseppe Maria Cardinal Tommasi.? St. Giuseppe Maria Tomasi di Lampedusa. Here is an excerpt from am article called "Change?" I wrote for the journal Sacred Music back in 1990 talking about this very saint. That article is to be found in various places on the net now. celebrated on January 3. He died in Rome in 1713." That's St. Joseph Maria Tomasi (1649-1713). He was a Theatine priest from Sicily who was ordained in Rome and spent the rest of his life in the city, primaily as a scholar of Sacred Scripture, the Mass, and the Divine Office. Even after Clement XI made him a cardinal, St. Tomasi continued to teach the catechism to children. The poor of Rome loved him as one of their most generous benefactors. While he was still alive people claimed to have been cured of their illnesses just by touching his cassock.